Portraits: British 19th C, West Midlands: Artists and Subjects 20 comments Who painted this portrait of John Wheeley Lea? The artist of this portrait depicting the Mayor of Worcester, John Wheeley Lea (of ‘Lea and Perrins’ fame), might be identifiable, especially if it was a presentation portrait. Can the artist be named? It reminds me of George Hayter somehow, though I doubt a provincial merchant would have been painted by someone favored by Queen Victoria. 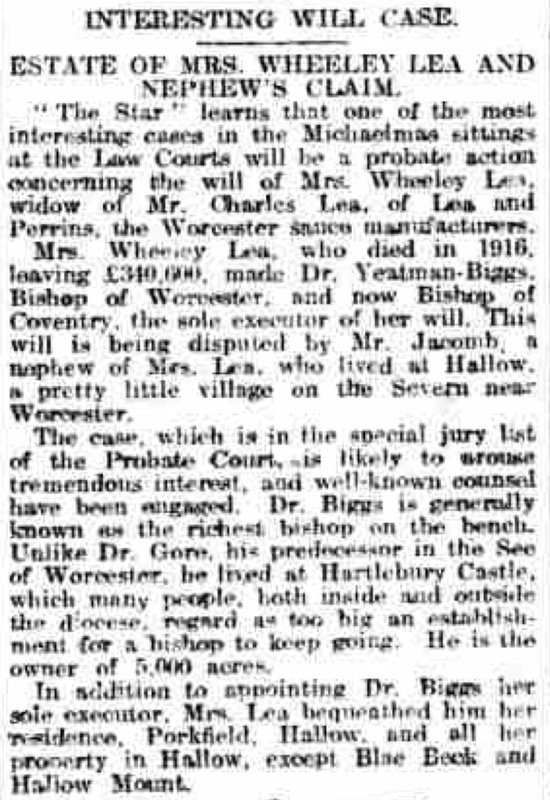 The Bishop of Worcester was the sole executor and beneficiary of the Will of Mrs Wheeley Lea. She was the daughter in law of John Wheeley Lea and the wife of his son Charles. After she died in 1916, the will was contested by the family and took another five years to be fully resolved. Her house, £27,000 and some contents eventually went to the Bishop, the rest shared through the family. As it appears that the painting came direct from the family through the executor to the museum, I suspect there will not be Sales records for this painting. Although as you can see from the attached article as well as leaving the painting of Wheely Lea, he also left a large Benjamin Leader painted to the Museum which according to Art UK the acquisition/provenance is unknown. I take it, then, that this portrait was not commissioned and thus owned by the City of Worcester, in which case it would presumably have remained in the Guildhall, but by the sitter himself. Has the picture been inspected for a signature or any other potentially helpful evidence on the back of the canvas? Solomon Cole seems to have been engaged to paint all the other Worcester 'worthies', this is possibly by him too. Yes, the comparison with Cole's other official Worcester portraits is quite convincing. I had been wondering Whether Solomon Cole was commissioned on the election of Wheeley Lea as Mayor to paint this portrait, but as he only lasted for a very limited time before resigning as the Mayor, it could not be presented. Solomon Cole was a local artist living in Bridge St and did seem to be the go-to person to paint the local dignitaries. It looks like the painting of Padmore in particular was very similar to Wheeley's. As if it was in the same studio. The background has been divided into very similar sections on both the left and the right and it also looks like they are both sat in the same chair. A number of the Cole portraits now in the Museum originated from the Guild Hall in Worcester. In fact, Samuel Cole was responsible for their "restoration in 1880. I'd never heard of him, but for a provincial artist, Cole's work is very respectable. If a little more can be found for a brief biographic sketch, that could be entered into ArtUK. 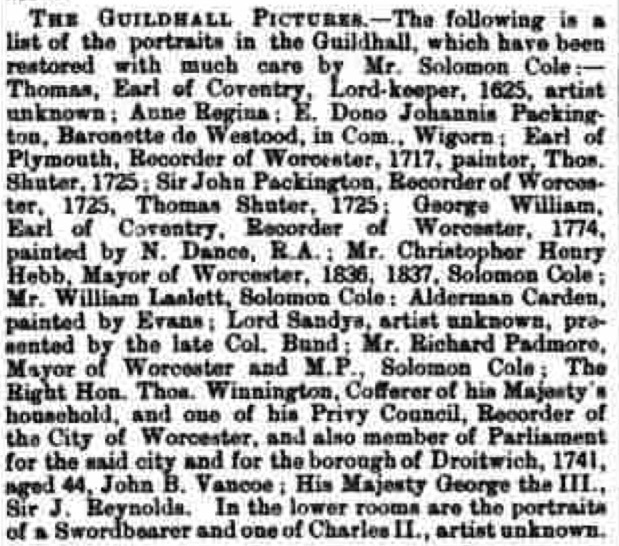 The official Cole portraits of the other "worthies" are still in the Worcester Guildhall, unlike that of Lea, which followed a different course and wound up in the Worcester City Museums (whose entire holdings listed on ArtUK I had searched for clues, to no avail). Most of the other Cole portraits on artuk were included in the 1882 Worcester 'Great' Exhibition. The catalogue is available on archive.org, and there's good info on those portraits in the catalogue (and maybe a bit more bio of Cole can be constructed from that). I've left my laptop power cable 200 miles away, and attempting it from a phone is not much fun! The Worcestershire Chronicle, of Wednesday 26th February 1840 (page 2), carries a report of the "The Testimonial to C. H. Hebb, Esq. ", and describes in great detail the painting, commissioned by subscription in October 1837 from Solomon Cole (then aged c.31), which took over two and a half years to be delivered. In the review, the Hebb painting by Cole is described as "the first full-length from his pencil", suggesting that the portrait of John Wheeley Lea, if also by Cole, must have been executed at a somewhat, though perhaps not too distant, later date. One thing is certain. 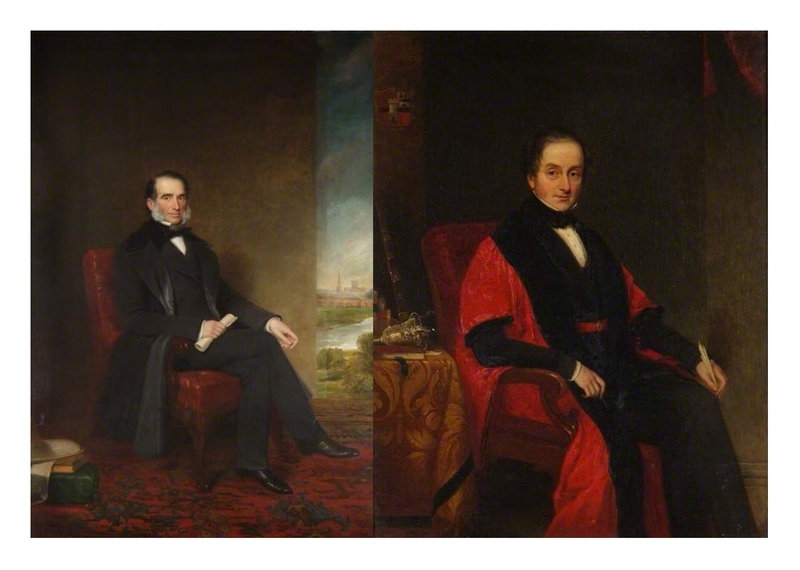 Unless Hebb was Mayor a second time, and was also again painted by Solomon Cole, the date of 1862 on the ArtUK website for artist's painting of the Hebb portrait should be backdated to 1840. The information I've read on Lea indicates he was elected Mayor of Worcester twice, first in 1835 (but only held office for 3 months) and again in 1849, when he served a full term. I expect his portrait by Cole is from his full term as mayor, ca. 1850. Lea was born in 1791, so he would have been in his early forties in 1835 and in his late fifties in 1849. This portrait of him looks more like the latter, again supporting a date ca. 1850. Correction - John Wheeley Lea was sworn in as Mayor of Worcester at a meeting of its Corporation on Monday 12th October 1835, and not in 1834 as stated above. He was replaced, by the above-mentioned Christopher Henry Hebb, on Friday 1st January 1836, as a consequence of the provisions of the newly-enacted Municipal Corporation Reform Act, which was passed on the 9th September and came into force on Sunday 27th December 1835. It is quite likely, therefore, that Wheeley Lea's portrait was executed by Solomon Cole sometime not too long after his very short term of Mayoral office. Jacinto, your instincts are most likely correct. If so, it does suggest that Solomon Cole was some style of official portrait painter to the Corporation from his first full-length of Hebb in 1837/1840 and onwards for at least another ten years until c.1850. The accounts of the Worcester Corporation might reveal a payment trail that confirms this suggestion. The city evidently later employed Ernest Waldron West (1904-1994), presumably another local artist, in a similar capacity. There are six portraits by him in the Worcester Guildhall collection. Cole was a more than competent artist who showed portraits at the Royal Academy from 1845 to 1859, while resident in Worcester. 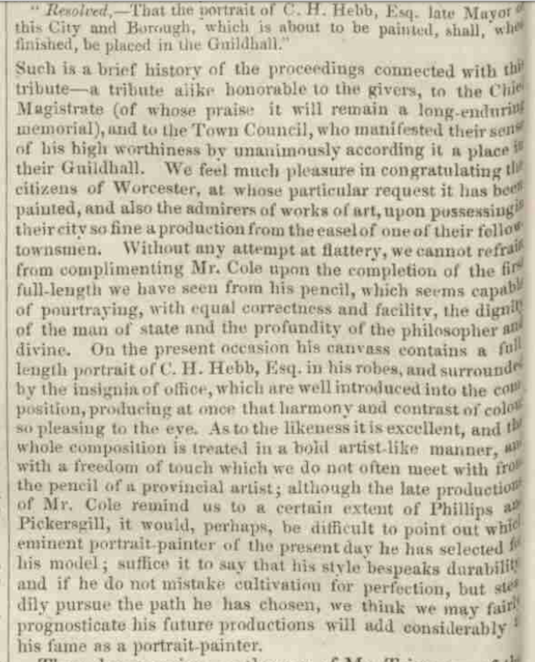 His beginnings as a porcelain painter in Worcester factories from 1821 explain his rather neat style of painting faces in particular. Other than being a student of Thomas Baxter in Worcester, there is not much information. Even his life and death dates seem to be approximations although we did learn from Kieran's post that Cole's first full length was the portrait of Hebb, and that took from 1837 to 1840 to complete.